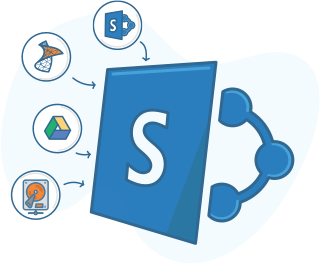 No matter how complex your migration, ShareGate Desktop simplifies the process by helping your business move to SharePoint faster, and without impacting your users. SharePoint migrations are complex enough as it is. The lack of time, resources and out-of-the-box options can make it even worse. Think of ShareGate Desktop as an ally that accompanies you before, during and after your migration, whether to SharePoint On Premises or to SharePoint Online in Microsoft Office 365. Planning is a critical step in every migration project. Building an inventory of the content, structure, users, and permissions of your current environment is the first step. This allows you to be more efficient because you know what needs to be migrated, archived or left behind. Use ShareGate Desktop to build a solid migration gameplan and estimate the effort required for a successful move, by listing everything contained in your environment. 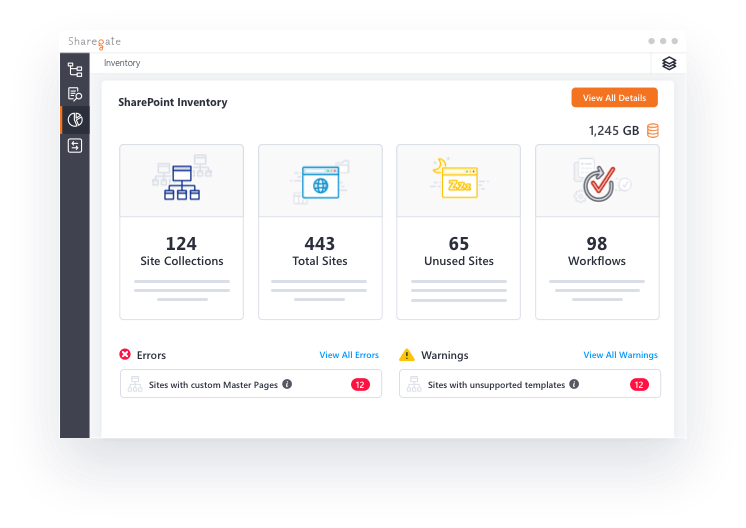 List all of the content, files and data in your environments and view potential migration errors with the Inventory feature. Have a clear view of all permissions in your current sites using the Permissions Matrix Report. No two migrations are the same: every business has a unique structure, permissions, workflows, configurations, and metadata. 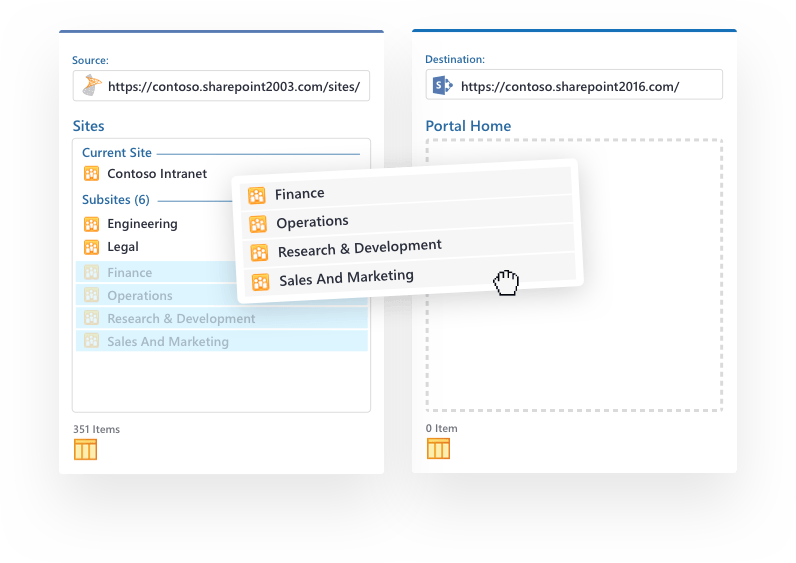 Whether you're moving to Microsoft SharePoint On-Premises or SharePoint Online in Office 365, there are complexities that most out of the box tools won’t cover. ShareGate Desktop helps you migrate your entire enterprise environment, or granularly move files, lists, libraries, sites, site collections, workflows and more. This way, you can personalize your migration experience according to your specific business needs, no matter the complexity, and without impacting your users. 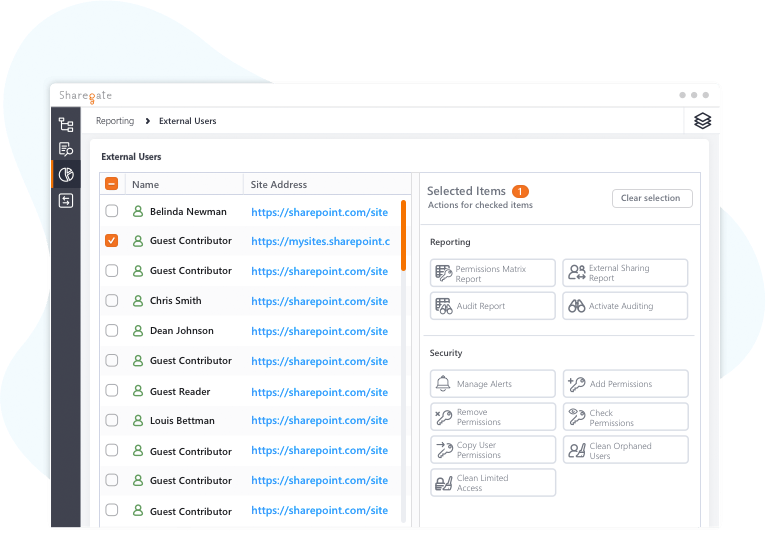 Once you've successfully migrated your content, you'll need to keep your new SharePoint environment healthy and secure by monitoring and managing it on a daily basis. Use ShareGate Desktop for document management, to reorganize content and structure, to manage user permissions and to keep track of user activity. Whether you're moving to the latest version of SharePoint or to Office 365, management is a crucial part of your migration's success. With ShareGate Desktop, there's no limit to the amount of data and files you can migrate, making it the go-to tool both for high volume migrations and day-to-day content management. ShareGate Desktop requires no installation on your server to perform a migration. You'll be ready to go in less than two minutes. ShareGate Desktop is the only recommended Nintex migration partner for migrating Nintex Workflows and forms. Our award-winning support team helps you overcome any obstacle you could encounter before, during and after your migration. They're here to help, and they do it right. From files and documents to entire sites and site collections, ShareGate lets you migrate anything from within your SharePoint, OneDrive for Business, Office 365, Box and Google Drive environments. Reach maximum migration speeds using ShareGate Desktop's Insane mode. It's the fastest way to migrate to SharePoint. Migrate to SharePoint at Insane Speeds.